PT KAI Commuter Jabodetabek or PT KCJ, as Commuter Line train operator, has announced their plan to raise ticket prices for Commuter Line Train as much Rp. 2000. The plan is opposed by KRL Mania community, because it assumes that the operator has not perform the Commuter Line train services for the Commuter Line users, such as the problem of the air conditioning, and also delays that frequent occur. Other Classic problem also recorded, when I was in Gondangdia Station on Monday, September 24, 2012 morning. 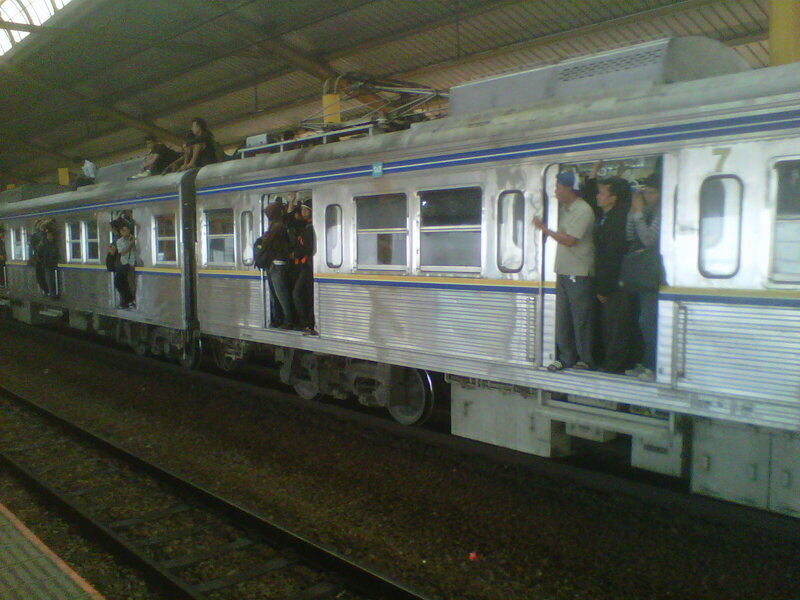 It showed that the the door on Commuter Line heading to Jakarta Kota Station can not be closed and some passengers were riding on the roof of the train. This issue would have to be addressed, because any increase in rates is always accompanied by the operator promise to improved its services to the users. Whether the rate increase or not, it should not preclude operators to improve services for consumers. Improved service should not directly related to rates, because the government should subsidize Commuter Line train users who are already using this mode of transportation to reduce congestion in Jakarta. It is also important to consider the mechanisms of compensation if the operator Commuter Line passenger does not get their rights. But that operators should also re-consider to make more equitable rate structure. It does not seem fair for Commuter Line passengers departing from Depok towards Gondangdia pay the same rate like passengers from Depok to Pasar Minggu. In addition, it is important to consider the unification of payments between Commuter Line with other transportation modes such as TransJakarta. There are currently two different types of electronic tickets between Commuter Line and TransJakarta. With the unification of the payment system schemes, public transport passengers can experience more benefits and also encourages the use of electronic ticketing to reduce the use of paper that is currently very popular in the Commuter Line train.